You've got the reading lists. You've got the books. But what else can you do to make your children better readers this summer? You can help them read more quickly and accurately. Schools call this reading fluency. Your kids will call it fun! When kids can read fluently, it's easier for them to understand what they're reading. And they read aloud easily and with expression. Needless to say, this makes reading a lot more enjoyable. Less fluent readers read more slowly and word by word. Their attention is focused on sounding out each word; so, they pay less attention to understanding what they've read. Their comprehension and their motivation can suffer. Of course, beginning readers aren't fluent yet, but by the end of first grade, kids should be reading books at their grade level with ease and expression. Help your child choose books that he can comfortably read. The "five-finger test" is a useful guideline for beginning readers. As your child reads, count the number of words he cannot read per page. In general, there should be five words or fewer that give him trouble on each page. If a book contains several pages on which you count more than five words that he can't read, consider reading that book to your child until he develops more reading skill. Once you've found a collection of books that your child can read, listen to your child read every day. Be patient — new readers often read slowly! Offer help when your child gets stuck, and always give lots of praise and encouragement. 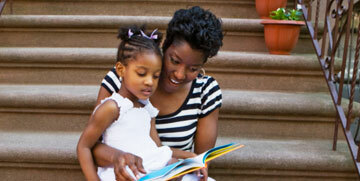 Encourage your child to reread favorite books, and make it fun! Repeated readings improve children's fluency and comprehension. They also provide opportunities to practice reading with expression. Children will enjoy giving the wolf a scary growl or using a squeaky little voice for a mouse. Model your own fluent reading as you read and reread books with your child. Even though your child may be able to read on her own, continue to find time each day to read books to her that are just beyond her reading level. She will enjoy listening to more advanced stories, and she will hear a great example of fluent reading. To find out more about helping your child become a more fluent reader, please visit Reading Rockets on the Web at www.readingrockets.org. For Spanish-speaking children, please visit the Colorín Colorado at www.colorincolorado.org. Cool summer reading is the perfect antidote for those hot summer days! Enjoy. Joanne Meier, Ph.D., is a research consultant for Reading Rockets.